The United States Airforce "Thunderbirds" and the Canadian Forces "Snowbirds", military air demonstration teams, were this year's headline attractions, along with the elite and renowned Canadian Forces Parachute Team, "SkyHawks", whose performance opened the 46th edition of the Abbotsford International AirShow. America's Ambassadors in Blue' brought speed, power, and thunder to the skies over Abbotsford, British Columbia on the weekend of August 8-10, with their six brightly coloured red, white, and blue F-16C "Fighting Falcons". An hour performance of narrated, thrilling smoke-on precision manoeuvre routines, demonstrating the capabilities of their first-line fighter aircraft left us all enthralled, entertained and a little better informed. Snowbirds, Canada's Star PerformersOn the other hand, Canada's remarkable and beloved "Snowbirds" of Canadian Forces 431 (Air Demonstration) Squadron, presented a quieter composition with their eight/nine-ship team of the venerable CT-114 Tutor jets. In keeping tuned to the capabilities of their charges, pilots and crews focus their attention more to graceful ballet-style performances of breath-taking formations and synchronized manoeuvres, likewise enhanced by music and narration. Other military performances included the F-15E Strike Eagle, flown by Capts. 'Ritz' Smith/"Wild" Colfer, a CF-18 Hornet with Capt. "Billy" Mitchell at the controls, and a USN F/A-18 Super Hornet guided by Lts. Patrick "Pigpen" Bernhard/Damon "Profile" Loveless. Headsets or earplugs mandatory!!! Premier civilian acts that were exceptionally good with their aerobatics included the Red Eagle Air Sports-Talon Eagle (Dan McClung), Red Eagle (Buck Roetman), Kent & Warren Pietsch (Interstate Cadet/Clipped-Wing Taylorcraft), Bill Carter and his Pitts Special S2S. Flypasts by Thunder Mustangs, vintage aircraft, and warbirds certainly captured attention of all spectators, particularly the B-25J Mitchell, and the A-1 Skyraider in the USAF Heritage Flight. Unforgettable sights and sounds. Although an overcast sky on Saturday hampered activities somewhat and perhaps affected several no-shows, but as always the show goes on, to the delight of enthusiastic fans and participants. Once again, hats off to all volunteers, and announcers; Roy Hafeli and the 40-year veteran Bob Singleton, without whom there would simply be no air show. Well Done! Photo Captions in the above spread. 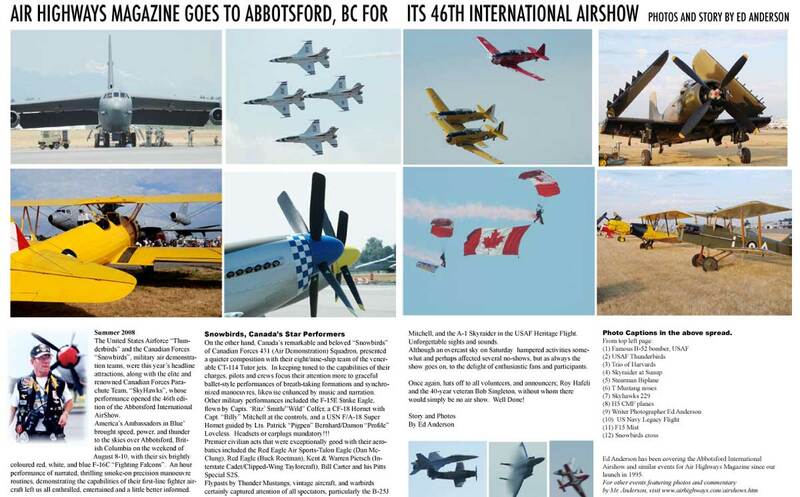 Ed Anderson has been covering the Abbotsford International Airshow and similar events for Air Highways Magazine since its launch in 1995.